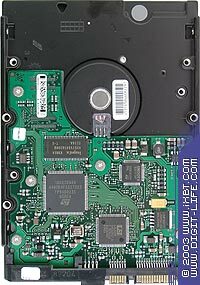 Although the Serial ATA interface has been much spoken about, and the boards supporting it are not news, the hard drive makers do not strive for launching such solutions on the market. Well, almost all leading manufacturers have announced models with the Serial ATA interface, but we have only recently received one of such drives (not a Parallel ATA drive with an adapter). 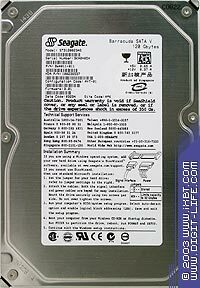 So, here it is - Seagate Barracuda ATA V ST3120023AS. 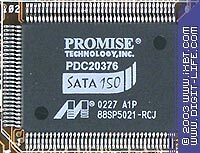 Seagate is one of the supporters of the Serial ATA conception. At their site they say that "Seagate has been a key player in defining and implementing Serial ATA. The Seagate SATA solution integrates Serial ATA PHY, Link and Transport layers with Seagate proprietary functionality that allows us to take advantage of Serial-ATA interface speed and emerging Serial-ATA features that enhance overall system performance". So, our aim is to estimate all such advantages. 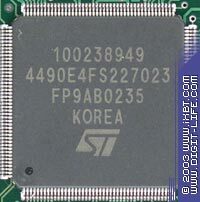 At first glance (through the transparent box), this model doesn't differ from the ST31200023A which was tested before, except the markings. The differences pop up on opening the box. First it's a 7-pin signal connector; then a 15-pin power supply one. However, it was unpleasant to find out that a normal power supply connector is missing. Formally, the specification doesn't require it, but there is space and it's still not easy to find Serial ATA cables on sale. Fortunately, the Gigabyte's boards come with brackets for external connection of Serial ATA drives with an appropriate adapter. In general, it's handy, especially because the same 4 connectors are used. If you want to know why 7 and 15 pins are used, here is the brief information. 7 signal pins include 3 ground ones, 2 for transfer and 2 for receipt. 15 power supply connectors include three for 12V, for 5V and for 3.3V, five Gnd and one is reserved. 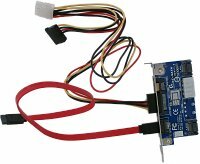 As the drive doesn't use 3.3V, we can go with a standard connector. For more information see the specification. I removed the SeaShield cover to have a look at the board with the electronics. 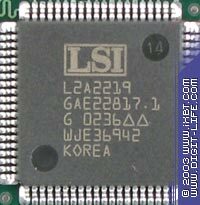 The Hynix's cache memory chip is not new. This one looks like the engine's controller. The technical characteristics of the drives are almost identical. The increase in the buffer size is a logical step because it's not simple to raise the platter plate exchange speed. 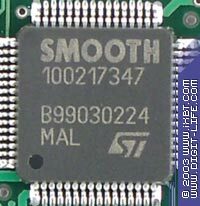 However, there is also a model with the parallel interface and a 8MB buffer - ST3120024A, but I didn't test it. The tests were carried out with two controllers - PDC20376 from Promise Technology and SiI3112ACT144 (further simply SiI3112) from Silicon Image. For comparison we used the results of the ST31200023A drive obtained on the standard test system. The average write speed of the Serial ATA drive is noticeably higher, and this parameter also depends on the controller. The performance is gained exactly at the expense of the Serial ATA interface, not at the expense of the greater buffer because the Western Digital drives didn't benefit from the increase in the buffer size in case of the write speed. The access time for the Serial ATA drive is greater according to the HDTach benchmark, and it also depends on the controller. It seems that the Promise's controller performs better. The Ziff-Davis WinBench doesn't show any considerable difference. As this parameter is one of the most important in performance estimation, below we will also find the Intel IOMeter's scores. As expected, the scores get higher due to the increased buffer and its exchange speed, especially in the Business WinMark, where the gain is almost double. Interestingly, the Silicon Image's controller has better results in case of small files. At last, look at how the controllers load the processor. The scores of the SiI3112 are really amazing. Well, I'm inclined to trust the Ziff-Davis more. This test provides the most showy results. Well, where is the advantage in the write speed? 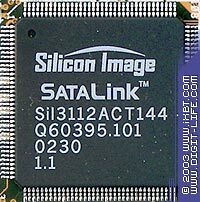 The Silicon Image's controller doesn't manage its task. The average response time was measured at the linear load on the Random Read and Random Write models. Who's guilty? The raw drivers? I don't know. But the parallel interface thrives here. And for dessert we have the serial access models. We thus get an average read/write speed on the disc's part covered in 10 minutes of the test. Well, the Highpoint's controller loses in the serial read speed in case of small blocks. Well, I'm not impressed much by the new interface, though I didn't expect a breakthrough... That is why do not hurry to replace your boards and drives. Let's just wait for more events.